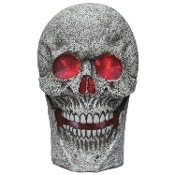 You'll be giving your Halloween decorations a morbid touch by incorporating this over-sized skull into the mix! This giant skull features color-changing lighting effects and haunting sounds that are activated by the motion sensor. Add to a party theme by displaying flat on a table or use hole to hang on the porch or wall for a grisly welcome. Over-sized decorations are the perfect finishing touches to your spooky landscape. 24-inch (60cm) tall, requires 3-AA batteries, not included. Made of Molded Plastic, approx 5 lbs. *Use indoors or in a covered or sheltered area.